An example of a Simple Workflow is if a bank being the client gave its employees access as a user to the Simple Workflow. The User working at the bank would use this for common practices like validating loan applications of credit scores. The User at the bank might not have any experience working in workflow and would easily be able to understand how to use the Simple Workflow designed for their banks common practices. 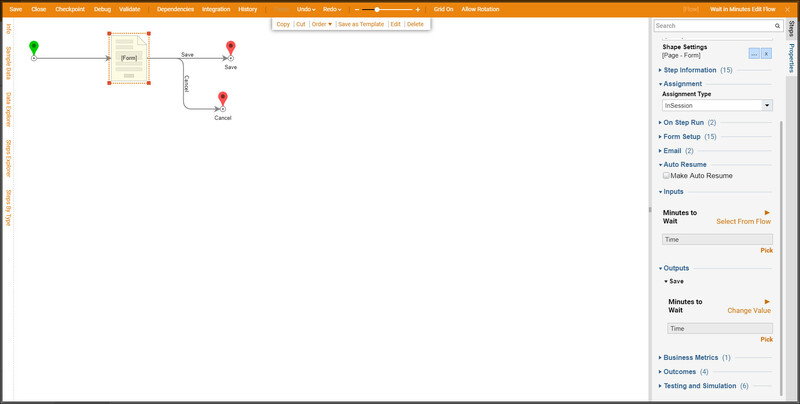 The document goes over an example of aSimple Workflow built for an End User. A Simple Workflow has been created by the designer that 1. sends an email, 2. waits a specified amount of time, 3. has a reminder, and 4. sends the final email. The time can be easily adjusted by theEnd User giving them the capability to adjust the wait time from two days to five days. 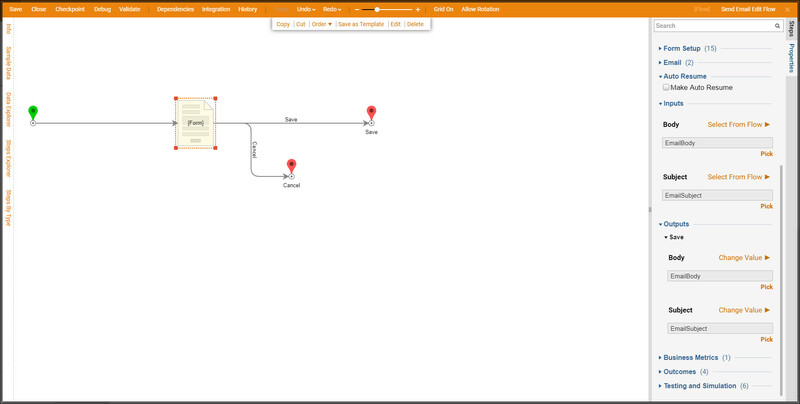 Below is a screenshot of the Finished Simple Flow. Begin by creating a new designer	folder	. Select the**(+)**	next to FOLDERS. Name this folder Marketing	Email	Campaign	. 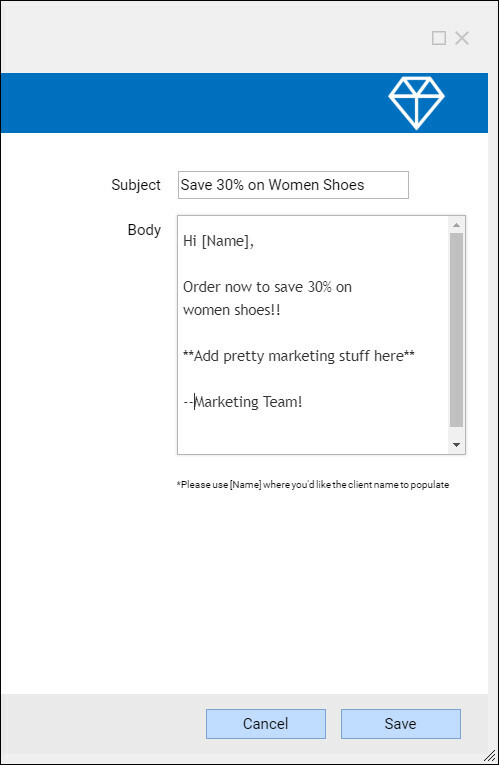 Next, create two more designer folders	within the Marketing Email Campaign,	named Simple Flow Steps,	and Simple Flows. Next create a Simple Flow within the Simple Flows	folder by navigating to the folder and within, selecting Create Flow	> Flow [Simple]	> Simple Flow. Name this Simple Flow:	30% Off Campaign. Select CREATE. 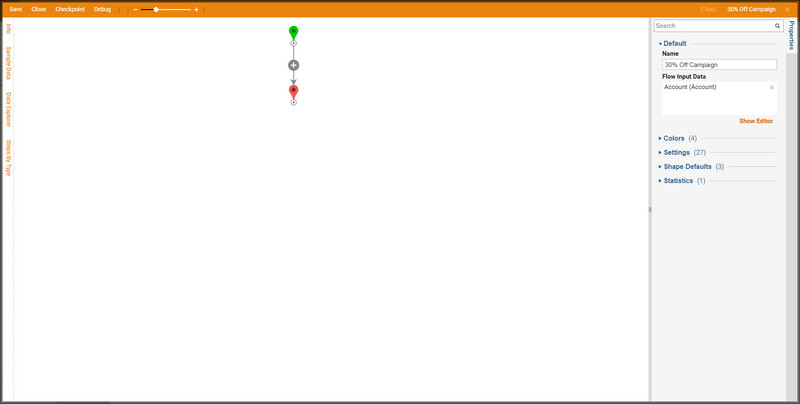 Within the Simple Flow Designer, steps can be added by selecting the (+)	symbol. The only step available will be a Branch Process	step until more Simple Flow Steps	are configured by a designer. 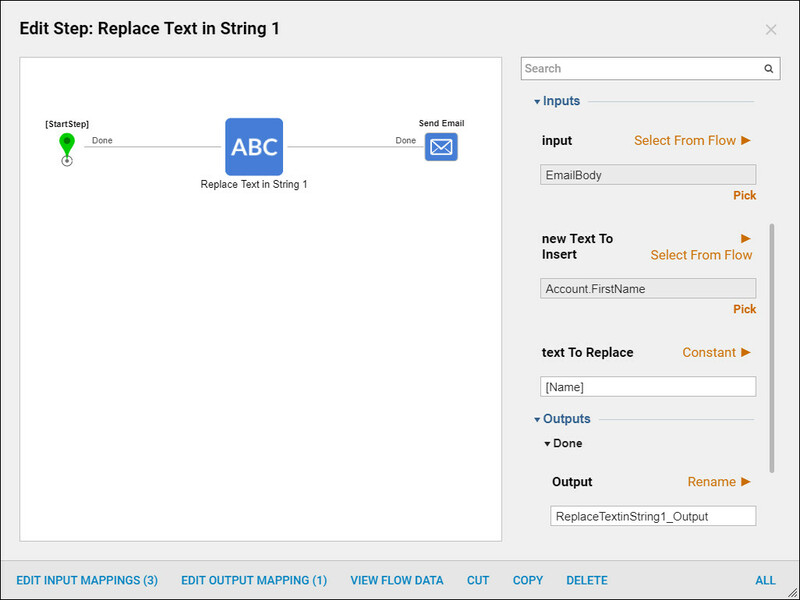 Configure the Flow Input Data by selecting the work space and choosing the Properties	Panel. Under Flow	Input Data	select Show Editor, define the data by naming it Account with the data type Account. Save and Close the Simple Flow Designer. Now create the Simple Flow Steps	that will be used within the Simple Flow. Create Flow	> Flow [Simple]	> Simple Flow Step. Name this Simple Flow Step,	Send Email	. This Designer is exactly like flow designer, it has a start and end step and validation errors. The difference is the properties panel, these properties help define the step with an image, background color and categorizing to allow the user to find the step. Within the Properties	Panel name the Category	as Campaign. For the Step	Image	search for an Email Icon. Select a background color. 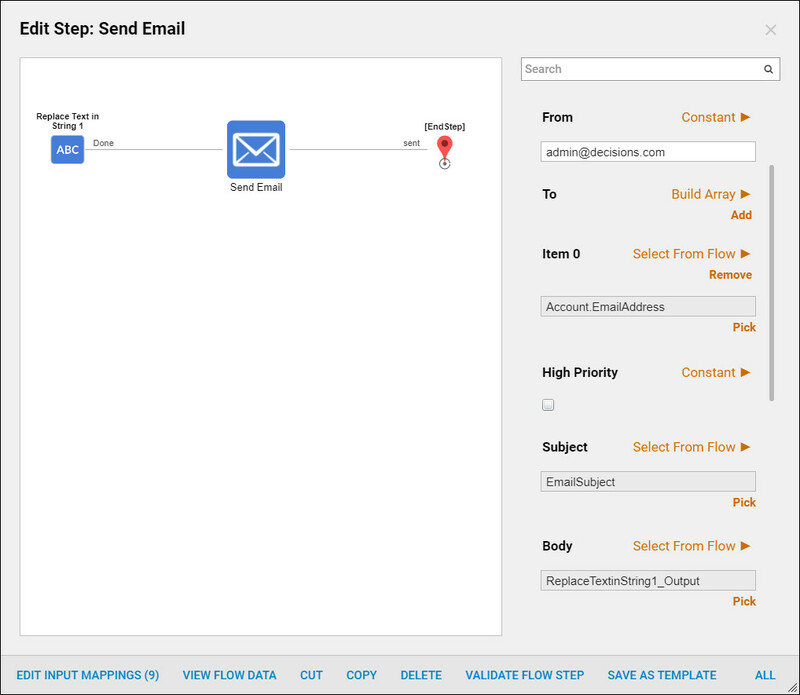 Under Flow Setup,	within Flow Configuration Values,	define EmailSubject	and EmailBody	both as strings. 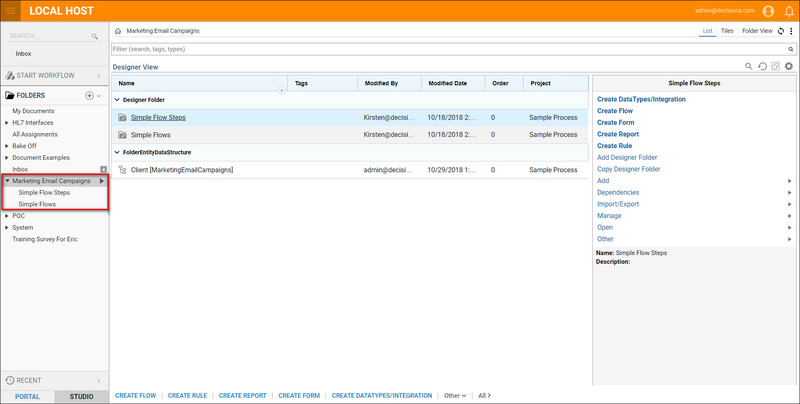 These are data elements that the process expert will be able to edit in the simple flow designer. For the Flow Anchor Data	define Account	as and Account	data type. Flow Anchor Data	is any data that should be passed to the flow. In a typical flow this would be defined under the start step. Add Replace Text in String	to the work space from the Steps	panel located: Data	> Text. Under Inputs	select EmailBody from flow. For new Text To Insert	chose Ac	count.FirstName. Under t	ext to Replace	type [Name]	as a Constant. Add Send Email	step from the Steps	panel under the Communication	category to the work space. Define From	as a Constant, a dmin@decisions.com. For the To	input, select BuildArray. Under Item	0	select, Account.EmailAddress	from flow. Define Subject	as EmailSubject	and Body	as ReplaceTextinString1_Output. Back in the Properties	panel under Edit Flow Setup	check Use Edit Flow	then select Edit. 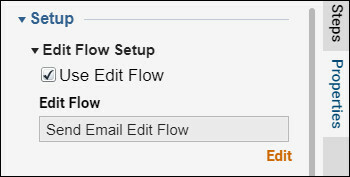 This flow allows designers to create flow setup that the end user will see while configuring the steps. 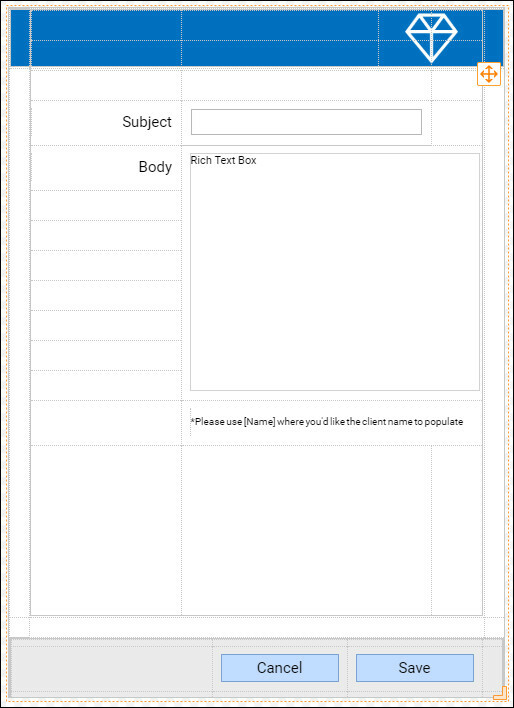 Add a Show Form	step, create a new form and name it, Send	Email Form. The Form Designer opens. Add two buttons to the form, name one Cancel	and the other Save. This form also needs a Textbox	labeled Subject,	and a Rich Textbox	labeled Body. Right align both labels. Add another label,	define it as " *Please use [Name] where you&apos;d like the client name to populate	". This is what the Replace Text in String	step that was defined earlier. Save and close the form designer. 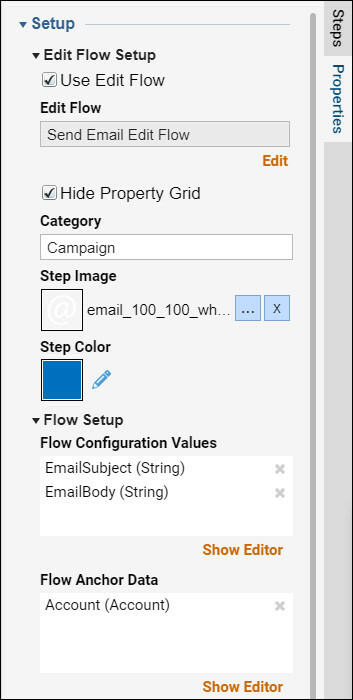 Select the Form	and within the Properties	panel in the flow designer, under Inputs	define Body	as EmailBody,	and Subject	as EmailSubject. Under Outputs, Change Value	of Body	to EmailBody. Change Value	ofSubject	to EmailSubject. Save	and Close	this flow designer. 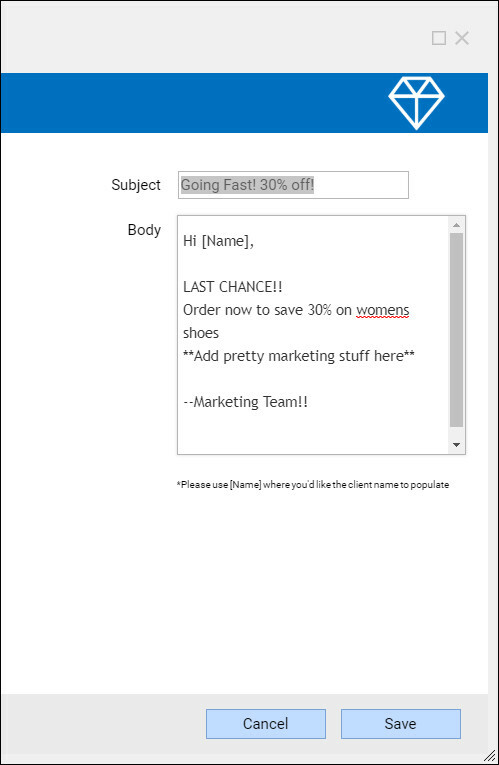 Then save	and close	the Send Email flow designer. Now create another Simple Flow Step,	navigate to Create Flow	> Flow [Simple]	> Simple Flow Step	name this step Wait In Minutes. Add a step image,	change the step color. 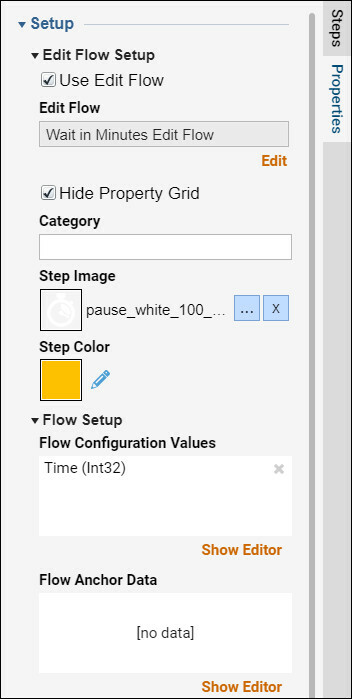 Under Flow Configuration Values	select Show Editor,	define Time	as Int32. Add the Add Minutes	step from the Steps	panel under Data > Dates. Under Inputs > Minutes	select Time	from flow. Define source Date	as Current Date Time. 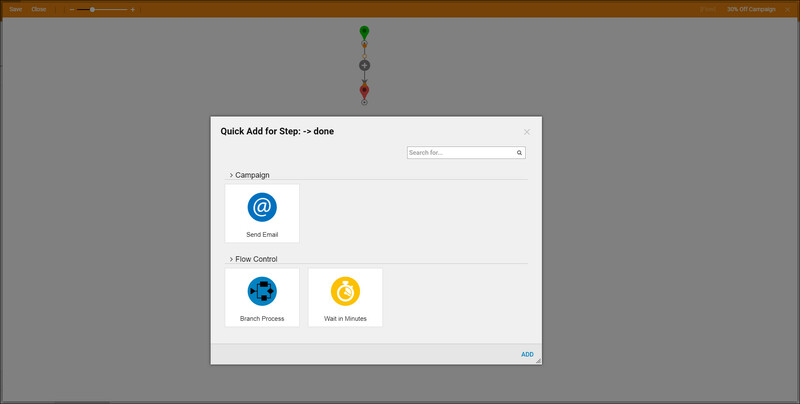 Add the Pause Flow	step from the Steps	panel under Flow Management. Under Inputs > Resume When	select AddMinutes_Output	from flow. Back in the Properties	panel under Edit Flow Setup	check Use Edit Flow	then select Edit. Add a Show Form	step, create a new form and name it, Wait in Minutes Form. The Form Designer opens. Add two buttons to the form, name one Cancel	and the other Save. This form also needs a Number Box	labeled Time. Right align both label. This form should have the same form background	as the previous from created in this example. Save	and Close	the form designer. 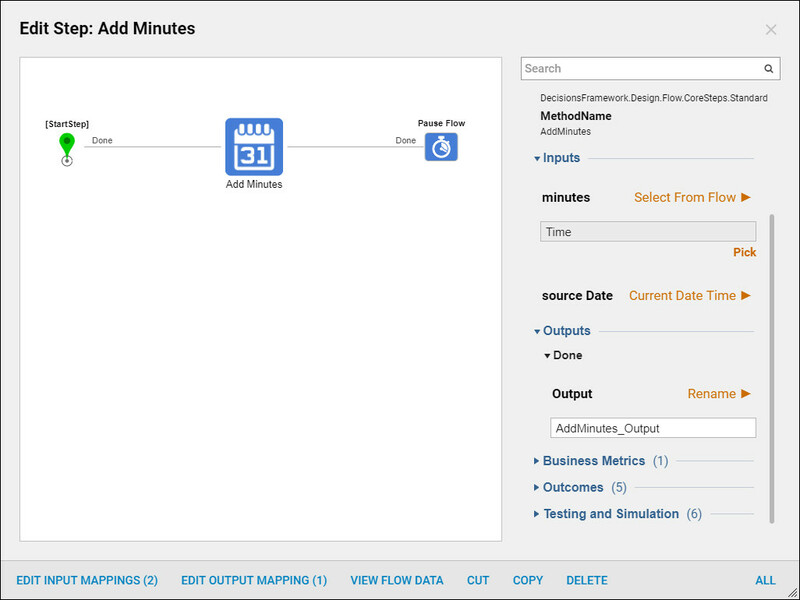 Select the Form	and within the Properties	panel in the flow designer, under Inputs	define Minutes to Waite	as Time	. Under Outputs, Change Value	of Minutes to Wait	to Time. Save	and Close	this flow designer. 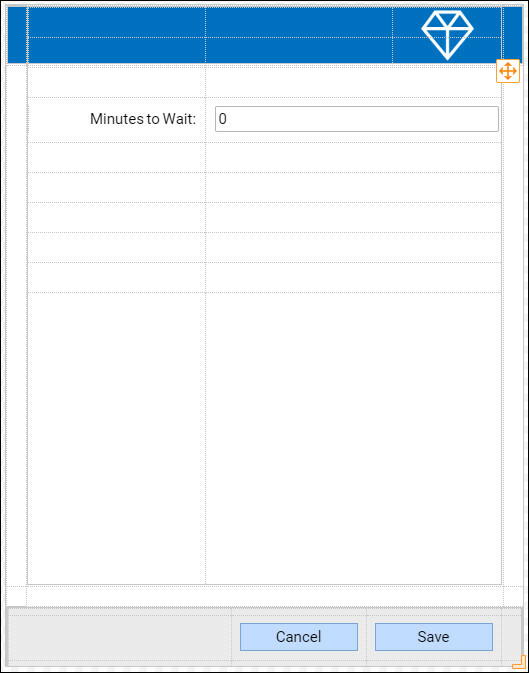 Then save	and close	the Wait in Minutes flow designer. This completes the configuring of the two Simple Flow Steps used in this example. This example requires new user to fully display the limited access and functionality of this feature. In the Main Folder Structure, navigate to System > Security > Accounts > Create Account. Name the account, example+marketing@decisions.com. Add the new account to two groups: Designers	and a Marketing Users	group. To learn more on how to create accounts navigate here and to learn about groups navigate here . With the new account created change the permissions on the designer folders created at the beginning of this example. Select Marketing Email Campaign	> Manage	> Manage permissions. Add the Marketing Users	group, select the Permissions Can Use	only. Select OK.	Then select Save Permissions. 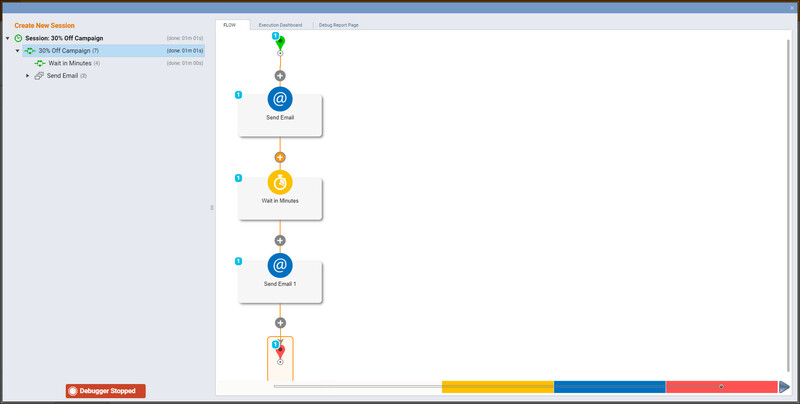 Select Simple Flows	> Manage	> Manage permissions. Add the Marketing Users	group, select the Permissions Can Use, Can Open, Can View, Can Edit, Can Add, Can Delete	. Select OK.	Then select Save Permissions. Login to example+marketing@decisions.com using an incognito window. Open Simple Flows > 30% Off Campaign	. Here you an see there are l imited actions and no properties panel. The only way to add a step is to select the (+)	button between the start	and end	step. Add the Send Email	step. The form created earlier appears to allow the user to configure the properties. Fill the Subject and Body fields and the select Save. Select the (+)	button after the Send Email	step, add the Wait in Minutes	step. When the properties dialog appears change the number to 1 minute, then select Save. Add another Send Email	step after the Wait in Minutes	step. Save	and Close	the Simple Flow. Log back into the admin account. 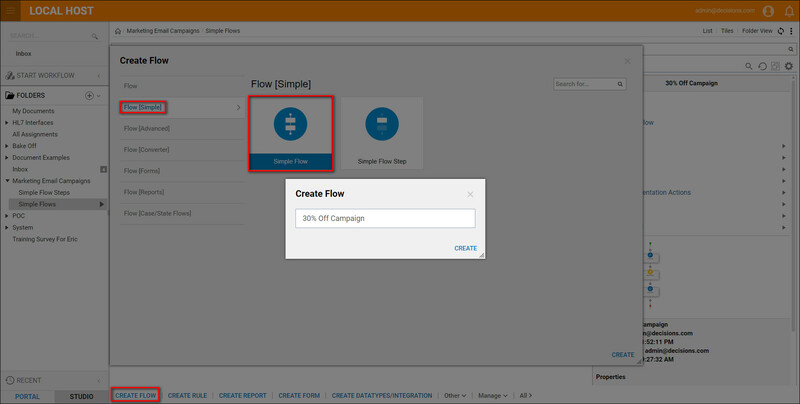 Navigate to the Simple Flow	folder and Debug	the 30% Off Campaign	flow. The flow executes as expected. This completes the Simple Workflow example!